The author of this post is LookIntoMyEyees. Thanks to Furrynutz for assisting with the post! I have created this guide to help users set up game fuel and port forward settings on the D-link DGL 4500.These setting have been tested and have given me a better online experience on the play station network and call of duty mw2. The Gaming and GameFuel Setup Information thread by FurryNutz about setting it up but for the Xbox 360, I hope this helps you guys get a better online experience. First you must open your browser and type 192.168.0.1 & login to the 4500 routers web page. Before we set up game fuel & open up some ports for the PlayStation we must first give it a static IP address but through the router. Reason for this is so when we open up ports or set up game fuel, we don’t want the IP address of the PlayStation 3 to change. 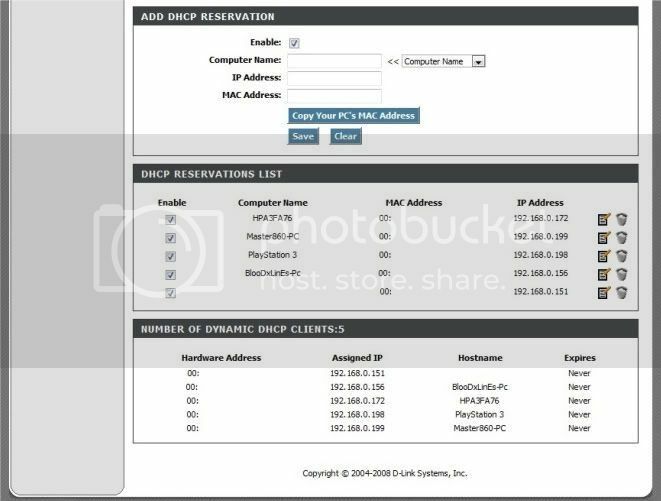 Once logged in navigate to Basic > Network Setting Look for Number of Dynamic DHCP Clients: Look for the PlayStation 3 Assigned IP address and click Reserve. If you don't know which one is your PlayStation 3 please turn your PlayStation unit on and navigate To Settings > System Settings > System Information and it will give you the PlayStation 3 Mac Address look for it on the Number of dynamic DHCP clients on your router and that's how you know which one is your PlaySation 3. Once you have clicked on Reserve you will see the tab above you has been filled with the required information now just Click Enabled. If is not checked, put the name you would want to give it (Put the name as PlayStation 3 it makes it easier for you later on) and click Save and after that click Save on the very top again, if it asks you to reboot, just click reboot later because we still have more settings to adjust. Now that you have a static IP address for your play station 3 we can move on to setting up game fuel. Now here is an image of how it should look like just do the following as seen in the image below. It is up to you to decide if Dynamic Fragmentation is right for you. I would highly suggest you leave it enabled unless you have a very fast upload speed. I would also highly suggest you disable Automatic Uplink Speed, and set Manual Uplink Speed that matches or is close enough to the upload speed that is provided by your ISP. For example if you take a look at the image above you will noticed that my Manual Up link speed is set to 5000kbps. That is because my ISP provides me with a 5Mbps upload speed thus that is what you should put in Manual Uplink speed. Navigate to Advanced > GAMEFUEL and look at the highlighted ADD GAMEFUEL RULE. 1 is the highest priority and 255 the lowest. Please notice that if you put priority 1, the router will make sure the PlayStation 3 gets top priority over any other device on your network. If any other device seems to slow down, you may want to lower the priority. Now you have noticed that I have left out local IP Range blank, which is because I need you to put the static IP you set up earlier for the PlaySation 3. Here is my settings and static IP. Your static could be the same as mine but you would have to go back to DHCP reservation and set it up there. Now you have successfully set up game fuel for the play station 3, save all settings. Navigate to Advanced > Firewall and look at the highlighted Nat Endpoint Filtering. Once there we will need to change both UDP Endpoint Filtering and TCP Endpoint Filtering to Endpoint Independent. Special thanks to the man with the FurryNutz, for providing these Firewall settings from his thread. These are the ports you can open for port forward. They might help performance. But remember this is generally not needed for gaming console so open them at your choice. Now you have successfully set up the router, save all settings and select REBOOT NOW If some how you can’t locate the reboot now please Navigate to TOOLS > SYSTEM and select Reboot the Device. Now that we are done setting up the router, we can now move onto the PlayStation 3 systems if your unit was on at the time the router was restarted you will need to turn off your unit and turn it back on. Now your ps3 will automatically acquire the Static IP and settings needed for it to connect to the internet. I noticed that my router runs smoother and cooler when I turn off the logs. How to get there? It’s Simple Status > Logs and disable the one’s you don’t want to log. You don't have to do this, but if you do remember logs are usually important they give you information that may help you solve an issue. As always I am contently upgrading and fixing and optimizing rules so you might want to check back on these rules once in a while.